KATHMANDU: The Department of Tourism has collected revenue of around Rs 40 million in four days from the mountain climbing permits. The Department has been issuing the permit for spring since March 23. 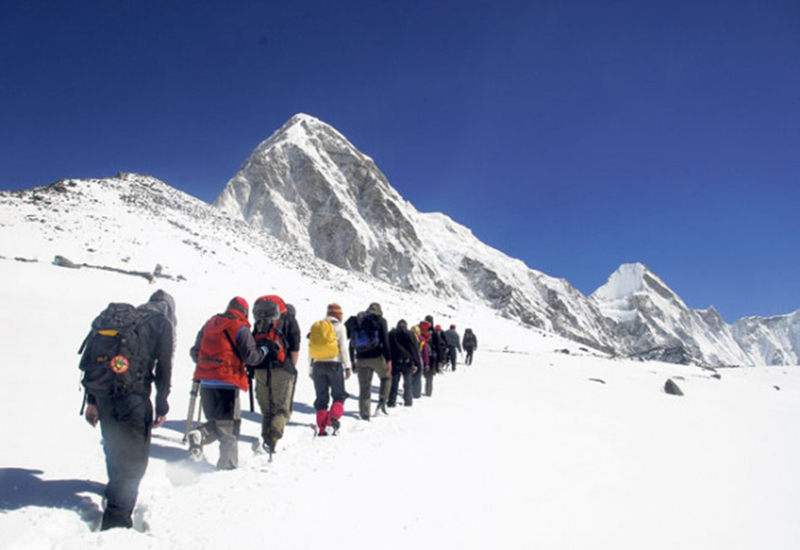 As said by Department's Mountaineering Section’s staff Rameshwor Niraula, over Rs 39 million has been collected in four days from the permits for several peaks including the Mount Everest and of the amount, Rs 35.3 million is from the permit for the Everest climbing. The Department till Monday had received applications from over 15 expeditions for the climbing permits and requests from nine teams have been already approved. The permits include the Everest (8,848 meters), Lhotse ( 8,516 meters), Annapurna ( 8,091 meters), Kumbhakarna ( 7,710 meters), Mount Pumari (7,161 meters), Thapa Peak ( Dhampus- 6,012 meters) and Chhopbamari. The deadline for seeking the permit will remain in effect until mid-April and the number of climbers will obviously go up. In 2018, the total of 107 expedition teams were granted the permits for spring and among them, 34 were for the Everest. Climbing royalty for the Everest, the world’s highest peak, differs according to seasons. According to the Department, a foreigner has to pay US dollar 11,000 in spring while this fee is US dollar 5,500 for autumn.